We thought Elder & Sister Pehrson would be dropping by so I made a big pot of taco soup. When they came, we learned that Elder Pehrson wasn't feeling well so they needed to go straight back home to their flat in "The Nest". What to do with a big pot of soup? I scooped it into small containers so I could freeze for later use. But then . . . a knock came on the door . . . and there were five HUNGRY missionaries! What a blessing that I had soup for all. They ate all the soup and all the buns and all the cookies and whatever else I could find. So nice to be there when missionaries need FOOD. It keeps us young to be associated with such fine young men!! Elder Card (from Cardston! Yeah!! ), Elder Ellis, Elder Lotulelei, Elder Hales, Elder Kiio. Click on the picture to enlarge and you'll see my grandchildren on the fridge and our daughter Heather and her fiance Vince. Well, it's kind of hard to see them but they are there. Elder Hales was one of the first missionaries we met when we came on mission here. He was an "office elder" so worked in the office next to us receiving referrals over the internet. 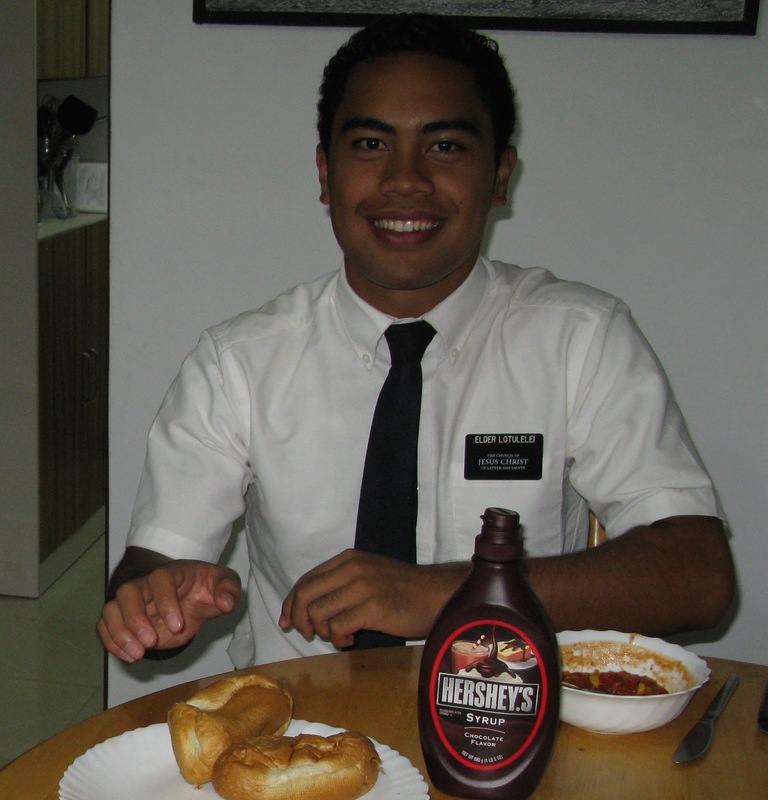 And Elder Kiio was in the first group of missionaries that LeRon and I processed when we were just new in the mission. Elder Kiio has a sister who is also serving in our mission. Elder Lotulelei stayed a couple of nights with us near Christmas time. We had a tiny Charlie Brown Christmas tree and he was excited to see it. The only Christmas tree he'd seen on his mission. And of course, Elder Card is one of our fellow Albertans and Elder Ellis is an Assistant to the President along with Elder Hales. They are all great young men and we're so happy to be associated with them.